Wednesday was a pajama day for Jacob. He wanted to stay in his jammies and do his homework! So that’s just what we did. He was supposed to decorate a turkey for his classroom. So he told me the specifics of what I was to do and what he was to do. My directions were to cut some feathers in the colors of his choice, punch some stars in the same colors as those feathers, and get the glue! He was to put things were they were supposed to be. He started with the feathers. 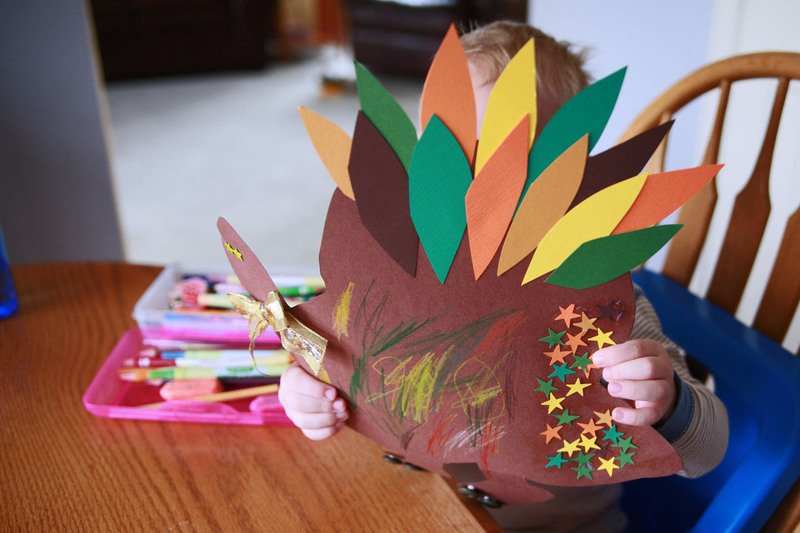 He put the glue stick on the turkey and placed the feathers. Then smeared more glue on the turkey (and a little on the table ;-)) and placed the stars. He put buttons on the feet and picked out the ribbon for a bow. He decided to ask me to make the bow and put star tacks for the eyes. He placed the bow though. He was so proud of it. On Thursday he marched it into his classroom and handed it right to his teacher with a huge smile on his face! Today was a special day for Jamie. In her soaring class (the enrichment program at school), she has been working on a project about the Sioux indian tribe. 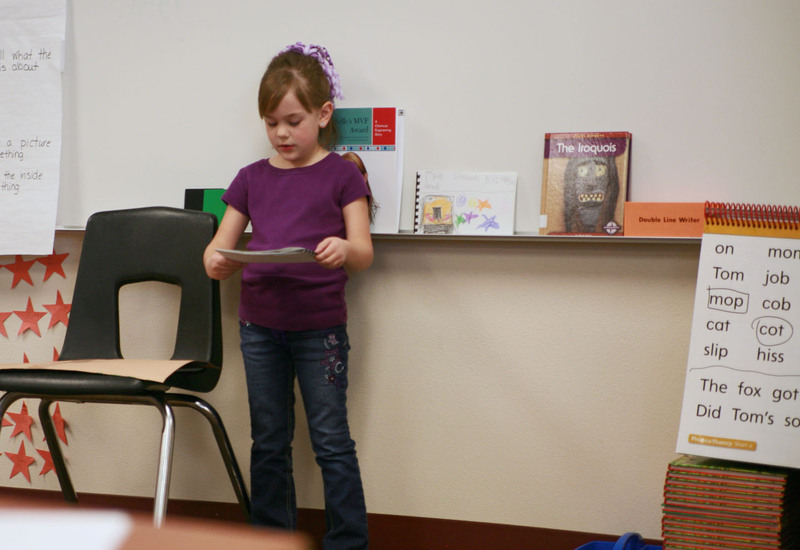 Today she was to present her information to her class. Anyone who knows Jamie, knows how big this was for her. She did such an awesome job! She read her book that she made with gorgeous drawings. She was to make a visual aide for her project and she chose to do a painting. She had a buffalo and buffalo rug on the picture as well as the Sioux Indian girl blowing a horn to warn the others in the tribe of a storm that was coming! All of this was done in front of the entire class. I was so proud of her for doing it! At supper, I asked her how she was able to do all that without being nervous. She smiled and said, “but I was very nervous”. Not to leave Mazie out, she is gearing up for her big Robotics competition. She has been working hard at the practices with her team getting ready. I have no pictures at this time but there will plenty of the actual competition! Jacob is so precious sleeping there all tuckered out! Your kids are Stahrs! Love it. THose art projects are fantastic! And I don’t think I could live without the boys’ naps. They all nap from 12-2 together & it’s the one piece of silence we get all day since they don’t believe in quiet time while their eyes are open. jamie and jacob those are gorgeous projects! 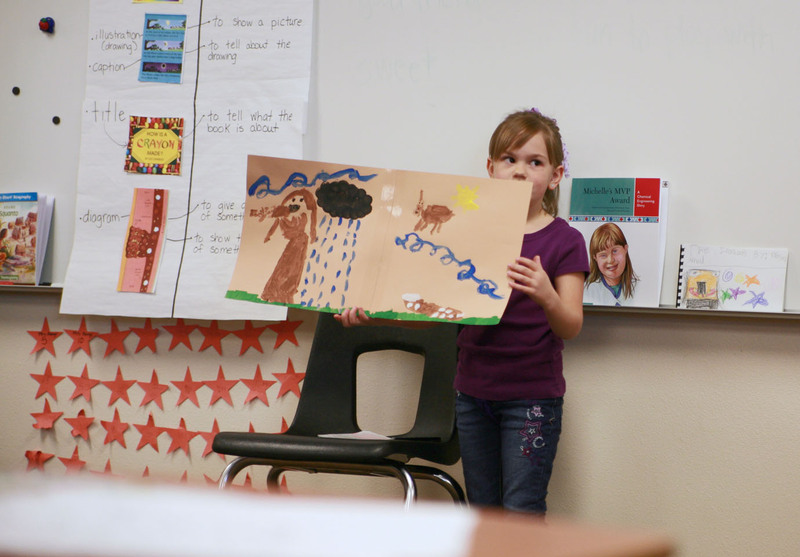 Great job, Jamie – what a wonderful presentation and in front of the whole class! So very proud of you. Nice turkey, Jacob. He will make someones’s table look very adorable at Thanksgiving. Good luck, Mazie, in your upcoming Robotics competetion – I know you and your team will do very well.